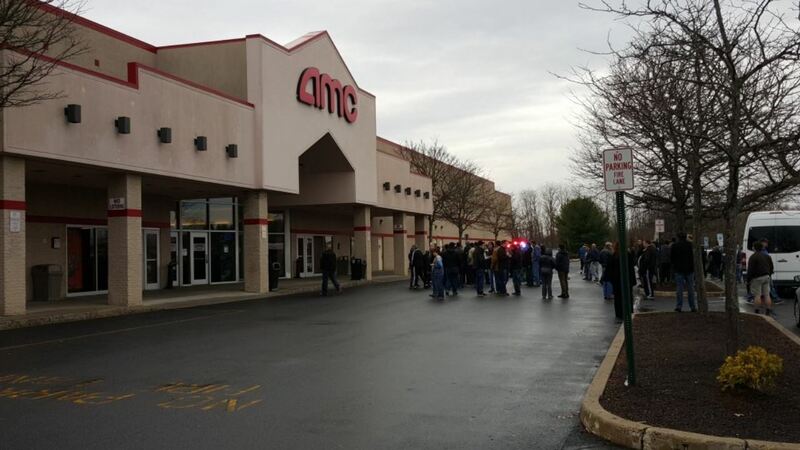 FREEHOLD TOWNSHIP, New Jersey (WABC) -- A showing of the new Star Wars movie was interrupted Friday in New Jersey after a theater was abruptly evacuated during the show. Friday night, police in Freehold Township announced that they had arrested a Middletown man and charged him with making a pair of bomb threats at the AMC Theater. 22-year-old Jesse Carroll of Middletown is charged with two counts of second degree Public False Alarm. He is currently being held in the Monmouth County Correction Institution on $200,000 bail with no 10% option. On Monday evening, Dec. 14, and again on Friday afternoon, Dec. 18, notes were found in the men's room of the movie complex containing threats to either the theater management or specific threats of bombs inside the theater. One note on Friday afternoon read: "I'm coming for blood; 4pm bomb, 6pm empty mag in guests." After each discovery the movie complex was safely evacuated while law enforcement was called to the scene. A thorough check of the movie complex yielded no threats to the safety of moviegoers, employees or management and business was returned to normal. #FreeholdTwp Due to Law Enf/Emerg Situation AVOID the area of AMC Theatre. Area closed, more to follow. Eyewitness News viewer Frank Giummo was in the theater at the time. He said no one has been told what the theater is going to do about the showing, as most all showings are sold out in the immediate future. Bomb threat called into theater - half way through movie, which is as getting GOOD! Screen went blank and someone screamed evacuate. "Making bomb threats in a movie theater is nothing short of domestic terrorism. Thankfully for everyone involved this was a hoax. We have wasted too much time, money and resources with these dangerous and disruptive threats. We will continue to fully respond to every threat to protect our citizens, but we are also going to react with the full force of the law every time threats turn out to be hoaxes," Gramiccioni said. "We take these threats seriously and I commend our partners in law enforcement for their rapid response in keeping our residents safe," said Monmouth County Sheriff Shaun Golden. "The security of our homeland is a top priority and such false alarms and hoaxes will not be tolerated." If convicted of Public False Alarm, Carroll faces a sentence of five to ten years in a New Jersey state prison for each count, which also comes with a fine of no less than $2,000 and up to the actual costs incurred by any first responder agencies. "Our Office fully intends to seek full restitution for the collective costs of all the responding agencies," Gramiccioni added. Anyone with additional information about this case should contact Detective John Catrone of the Freehold Township Police Department at 732-462-7500, or Detective Patrick Petruziello of the Monmouth County Prosecutor's Office at 800-533-7443.